Spotify and SXSW have teamed up to bring the music of SXSW to people all over the world. Starting today, users can access SXSW genre-specific curated playlists on the Spotify SXSW 2017 hub in “Browse” on desktop and mobile. Fans can also access the SXSW genre-curated playlists within the SXSW GO App. 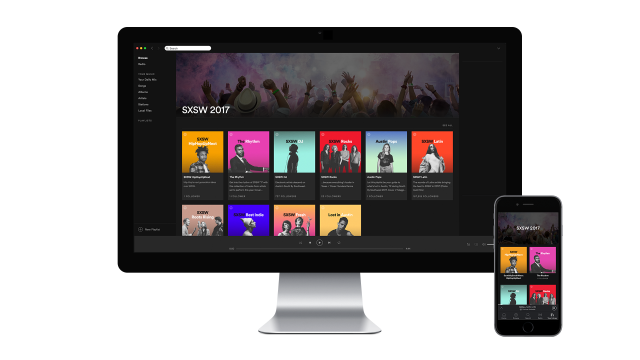 Spotify has integrated with the SXSW GO App to help users discover and explore over 2,200 artists performing at the 2017 SXSW Music Festival. Accessible through “Discover” in the SXSW GO app, the integration will include Spotify genre-specific curated playlists as well as curated recommendations for each day of the festival. Premium and Free Spotify users can also use the SXSW GO App to generate a custom playlist of SXSW performing artists based on their listening habits on Spotify. The Spotify curated playlists will serve as a guide for users navigating the always incredible line-up of performances at SXSW. Through www.spotify.com/SXSW and within SXSW GO, you can explore SXSW genre-specific playlists curated by Spotify and updated throughout the festival. Additionally, starting March 13, the first day of the SXSW Music Festival, an additional Spotify curated daily playlist will be available on the Spotify SXSW 2017 hub and on the SXSW GO app to serve as a guide to each day’s performing artists.